It started Saturday when I bought the candied fruit for the Christmas Fruit Cakes. I picked up a quart of rum as well. Came home, dumped the fruit into the large covered Tupperware bowl, added some rum and now the mixture is soaking until coming weekend when I’ll bake the cakes (I flip the covered bowl twice a day to make sure the rum gets absorbed by all of the fruit). Yesterday, I pulled out the cake recipe to see what ingredients I had in the house and what I needed to buy: flour, white sugar, molasses, bakers’ bittersweet chocolate, baking powder, eggs (I had brown sugar, baking soda on hand). Then I checked the spices – ginger, allspice, clove, nutmeg – had enough of each of those but no cinnamon. So I headed to Bulk Barn to pick up some cinnamon. While I’m standing in front of the spices I think it’s a good idea to pick up fresh amounts of the other four as well. I came home, emptied the old spices out, washed the bottles and put the fresh spices in. Even made labels for the jars. 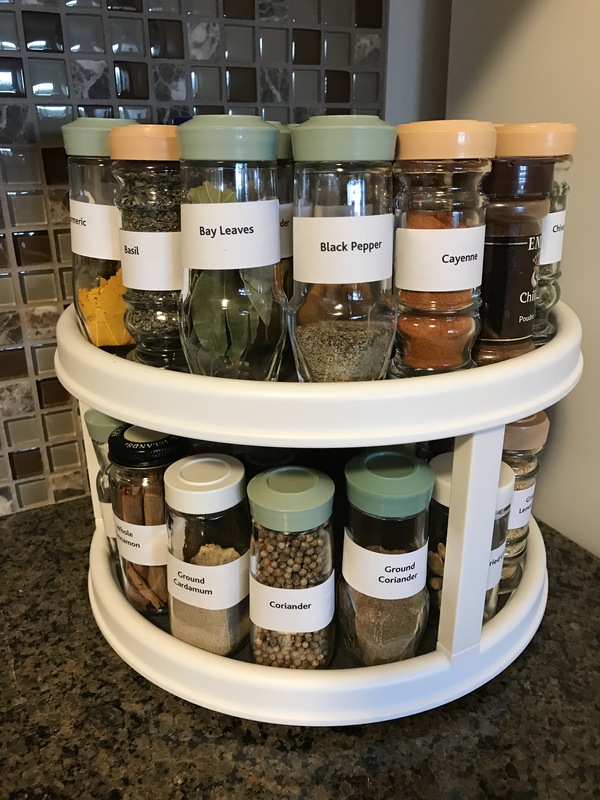 Then, I looked at my spice rack and think to myself – I meant to renew those before I moved out of the house, then after I moved into the apartment – it’s two years and I still haven’t done it. So I did the deed – I dumped out all the spices and herbs, put the jars in the sink to soak. Cleaned them, removed labels and set them aside to dry. Today, I made a trip back to Bulk Barn with my alphabetized list of spices and herbs (that way it was easy to find what I needed since the spices in the store are arranged in alphabetical order) to get small amounts of each to fill my clean, dry spice jars. Just finished the job. Each jar is labelled. The spices and herbs are actually stored in alphabetical order (I’m sure they won’t stay that way but it’s a good starting point). I didn’t replace everything – only those I might actually use – didn’t bother with herbes de provence, garam masala, 5 Chinese spice, whole allspice, whole cardamom… in other words, stuff I’d picked up for a single recipe and never used again! So I actually have about 15 jars to spare which I’ve tucked in a shoe box and stashed in the cupboard above my refrigerator for when I might need one. 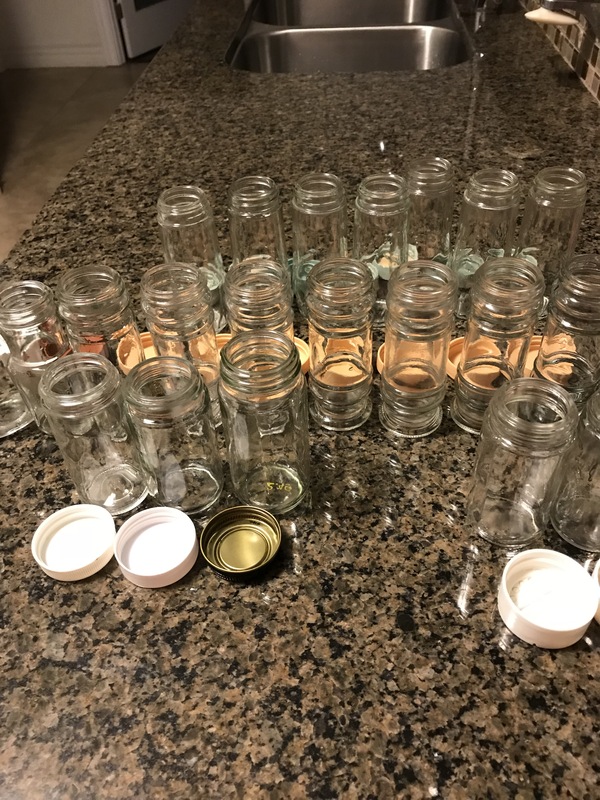 Addendum (Oct 16) – Just for information – the price on the back of many of the jars was 49¢! That tells you just how long ago I bought the original spices. I’ve refilled the jars many times over the years but I bet the spices in some of jars were 20 years old. Now to return to sewing a back for the latest quilt.